Good quality lighting- highly efficient optical system ensuring an effective low glare lighting solution. Energy saving solution- high efficiency white reflector, high transitive diffuser and high power LED's delivers an effective energy efficient solution..
Philips 15W Round Warm White 500g LED DownLight, BBS 170 is a premium quality LED Downlights from Philips. Moglix is a well-known ecommerce platform for qualitative range of LED Downlights. 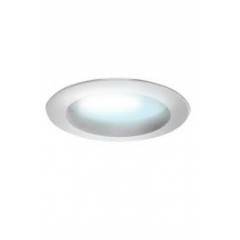 All Philips 15W Round Warm White 500g LED DownLight, BBS 170 are manufactured by using quality assured material and advanced techniques, which make them up to the standard in this highly challenging field. The materials utilized to manufacture Philips 15W Round Warm White 500g LED DownLight, BBS 170, are sourced from the most reliable and official LED Downlights vendors, chosen after performing detailed market surveys. Thus, Philips products are widely acknowledged in the market for their high quality. We are dedicatedly involved in providing an excellent quality array of Philips LED Downlights.